New York: A contemporary Indian new media artist, Shilpa Gupta’s body of work presents a consistent progression in theory and practice that has rightfully earned her a firm spot in the arena of contemporary Indian art. Alumni of the Sir J. J. School of Fine Arts in Mumbai, the main crux of her artistic practice is to explore the role and purpose of art- this enquiry taking many forms. The artists has had a packed start to the year, currently exhibiting at Galerie im Taxispalais in Innsbruck, Austria in a show titled Will we ever be able to mark enough?, curated by Renee Baert and which will subsequently travel to Montreal and Bruges. Gupta is also showing at Art Basel. 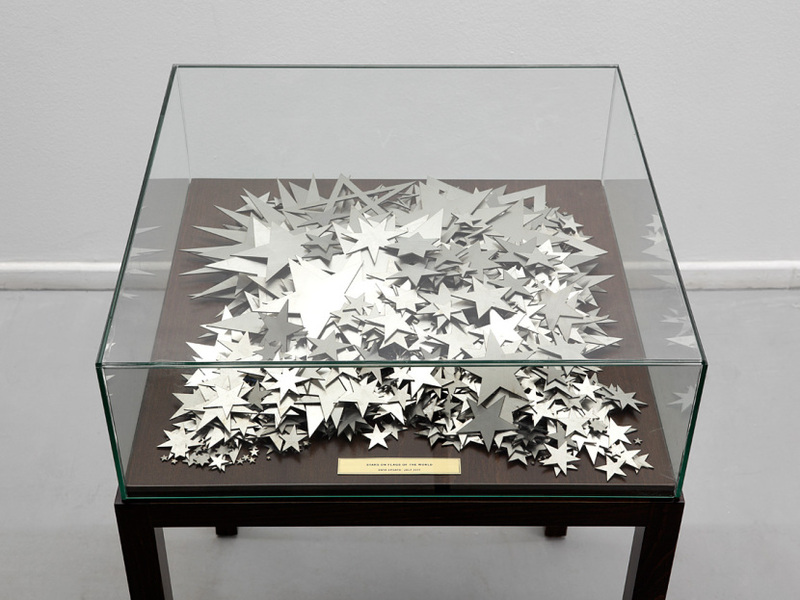 Her works at the art fair include Stars on flags of the world with the Mumbai based gallery Chemould Prescott Road, Untitled shown by the Parisian gallery Yvon Lambert and 2651-1 by Dvir Gallery from Tel Aviv, Israel. In the first half of 2013 alone, she has been featured in various group shows at places including the Bristol Museum & Art Gallery in England, the Singapore Art Museum, the Golden Thread Gallery in Belfast, the Guggenheim in New York, the Sharjah Biennial in the United Arab Emirates and a group show at the Faurschou Foundation in Copenhagen. Gupta is careful in her rhetoric not to delegate categories to identify her work or practice. She prefers to call it ‘everyday art’ given her preoccupation with daily observations and current events. To relegate her works to set categories would be limiting the scope of their discourse and its reception by the viewer. In “Stars on flags of the world” a glass vitrine holds hundreds of steel stars, like those found on national flags from around the world. The piles of stars are reflective of the appropriation of this particular insignia in constructing a national identity and narrative- much like alphabets that are put together to form words. 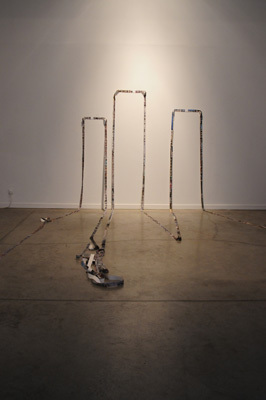 Although seemingly political, her works hold a wider conversation with a willing ear and keen eye. Regardless of the content and narrative of her works, Gupta is clear that her works are not simply ‘political’- a badge often pinned to works of art that comment on political and social scenarios. Her preoccupation is rather centered on the meaning of language. The multi layered contexts of her works not only point at the different tangents that they traverse, but their reception by the viewer also highlight the gamut of popular perception that a work encounters on its completion- the afterlife of the work. The viewers’ response is an integral part of her practice- sometimes evident and at other times concealed. 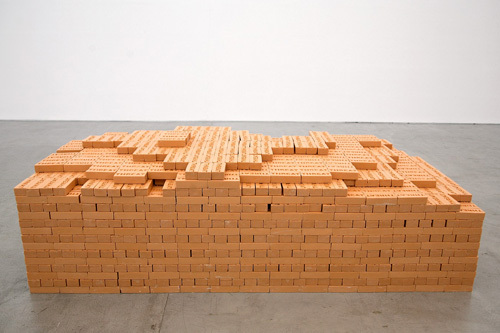 Shilpa Gupta’s “Threat”, first created in 2009, depicts a stack of bricks simulating a wall. The bricks are cast soap embossed with the word THREAT. The smell is powerfully soapy; it builds as you near the work. The work is performative- the viewer is encouraged to pick and take back a brick, this action depleting the ‘threat’- physically and symbolically. The degenerative and fleeting tactility of a bar of soap makes the viewer think of the emotional response to threat- sudden and strong, yet impermanent and short-lived. “2652-1”, being shown by the Tel Aviv gallery Dvir at Art Basel, recounts the number of steps the artist took between Al Aksa Mosque, the Western Wall and the Church of the Holy Sepulcher in Jerusalem. Gupta assembled small photographs that she took while walking between the three sites, resulting in a thin 42-meter long canvas. The work highlights the physical proximity of these geographical locations juxtaposed with the political, religious and ideological schisms that creates separation between them. The process of globalization over the past decades is traced in varying doses in her works. Narratives of identity, nationhood, borders and boundaries and power relations are implicitly imbedded is the coded discourse of her multivalent works. It is this quality that makes her works relevant to a contemporary international audience of varying sensibilities. The artist has recently featured in a two-part film on contemporary Indian art entitled ‘Let the World in’.